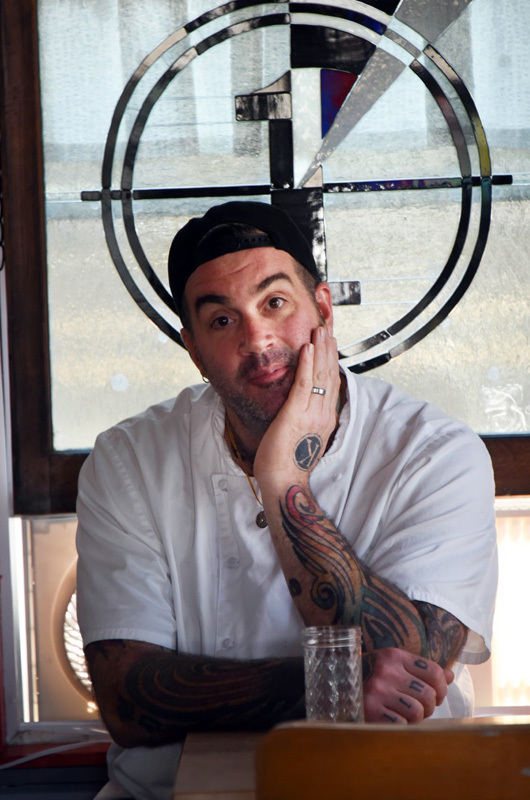 Ben DeForest chef at the Red Cat Kitchen in Oak Bluffs, hosted the Obamas last Saturday. There’s been an update from the secret service: The Obamas are 10 minutes out. I am told I will need to stand back in the kitchen while the former President and First Lady enter the restaurant through a side door and outside to the private patio in back. Chef Ben DeForest has positioned me in the doorway between the kitchen and the service area. It’s a most excellent fly-on-the-wall spot, even if I am sharing space with the hand sink and trying not to dip my elbows in a pan of braised pork shanks. It’s Saturday night at the Red Cat Kitchen: a playlist of Stones, Kinks, and Dead, every seat in the joint taken. The vibe is New Orleans-meets Vineyard, laid back and buzzed at the same time. Hot color, shiny glass, Island artwork, music memorabilia. All funky, all good. And at the helm of all this, the Island’s own original bad-boy chef, a man as well known for his food as his temper and his exploits. And when you are 6’5” with tattoos to spare, it can be difficult to fill your size 15 shoes with a humble presence. But that is Ben’s clear intention. Two years drug and alcohol-free, newly married and committed to being a good father, a good husband and a good person (in his own words), he agreed to let me interview him on Friday, ostensibly about food and cooking, but in reality about discovering what Ben the man, not the myth, is all about. I leave my interview with Ben on Friday thinking it’s a wrap, only to get a phone call early Saturday morning and an offer I can’t refuse. Which is how I’ve come to be in this spot in the kitchen. 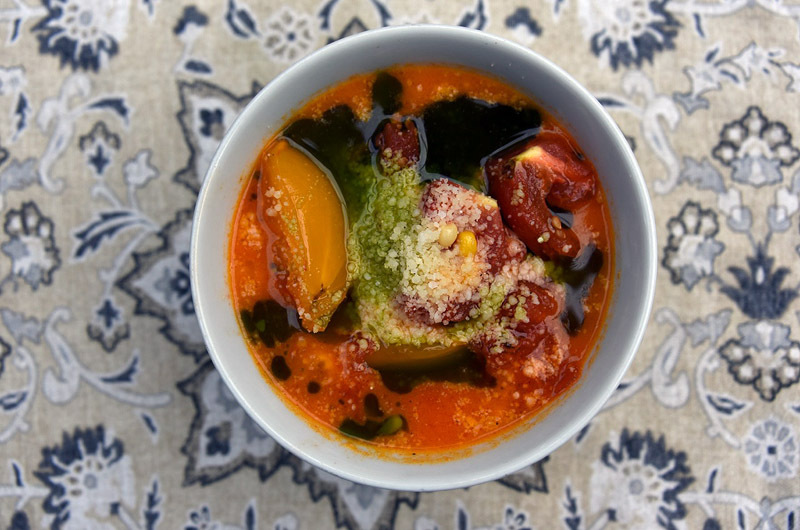 A few minutes earlier, I sat at the Red Cat’s bar and scarfed down a serving of Island Fresca, a bowl of ripe tomatoes and fresh corn in a long-simmered corn broth seasoned with basil and generously topped with Parmigianno Reggiano. It’s a dish Ben (who lists his job as Tomato Practitioner on his Facebook profile) created for the original Red Cat restaurant on State Road in the early 1990s. It recalls a strong memory of his father’s love for fresh corn and ripe tomatoes, especially during summers on the Vineyard when he was a child. The Fresca is the most delicious thing I’ve eaten all summer and I’m sorry I have to eat it so quickly. I’m also a little sorry to leave the bar area, where I’ve just met Erica DeForest (aka The Tiny Baker), who married Ben on June 24, and where there is a growing hum of giddy restlessness from those who know the former President is coming. But the soup is filling and will see me through the evening. Later, small tastes will come my way from the kitchen: melt-in-your mouth gnocchi, sweet corn risotto, crispy Brussels sprouts, a mindblowing shot of what’s billed as liquid corn on the cob. One last sweep by two men with grim expressions and earpieces, and the screen door opens. The Obamas arrive, their second visit to the Red Cat this season on the last night of their vacation. 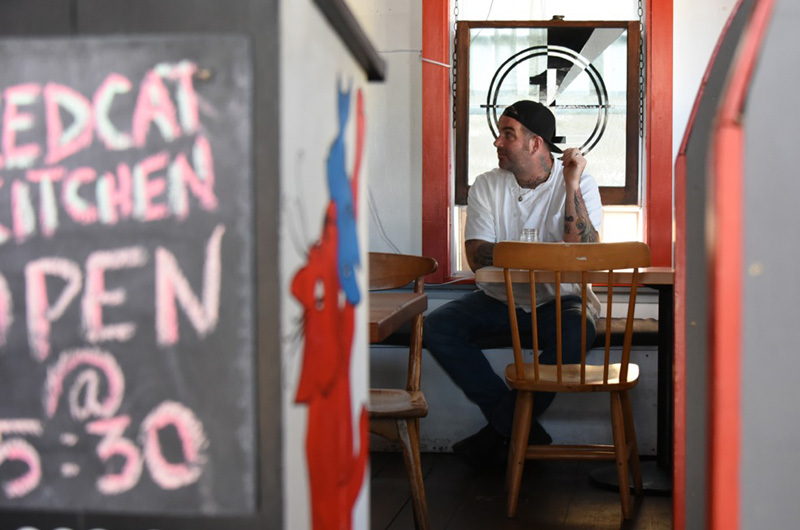 The reservations and seating plans have been carefully choreographed by Ben and Red Cat manager Kate Dougherty, and everything seems to be running smoothly. The chef has not screamed once. He doesn’t even look like he’s thinking about it — though it’s hard to tell without looking directly at his thick, arching eyebrows, where all his expression lies. He continued: “Now I’ve become a person who’s consistent and you can expect the truth from and you can rely on — all these things that I never was before. And the thought of being a reliable person is really appealing to me because I have two daughters.” Clementine is three, Adelaide 10. Ben’s oldest, son Job, is in San Francisco. Tonight he lets the servers do their thing and goes back to expediting. Despite the drugs, and sometimes because of them, he’s cultivated relationships with a long list of stars and has a comfort level with them. He cooked privately for Bruce Willis for six years, cooked for Bill Clinton, hung out with Keith Richards, got married on Dan Aykroyd’s property with his friend Jim Belushi in attendance. And it goes on. As the Obamas and their guests eat quietly in the back, the restaurant fills to peak Saturday night capacity and the buzz turns to a roar. The pace in the kitchen ratchets up. From my perch I’ve been getting to know the young man washing dishes (Andre McCormack) and the young man making salads (Alex Malcolm). I’ve tried to stay out of the way of the servers, plastering myself against the wall whenever I hear, “Hot! Hot! Hot! Hot Behind You!” because I know one of the cooks — Peter Bradford, Colin Coyle, or sous chef James Smith — is coming off the line with a stack of exceedingly hot iron skillets which will sizzle and spray when they hit the dish water. I’ve watched Alex make dozens of frisee salads with peaches, small-batch ricotta, truffle oil, and house-made ginger vinegar — a dish that Ben added to Evolution #107, his 107th menu variation for the season. 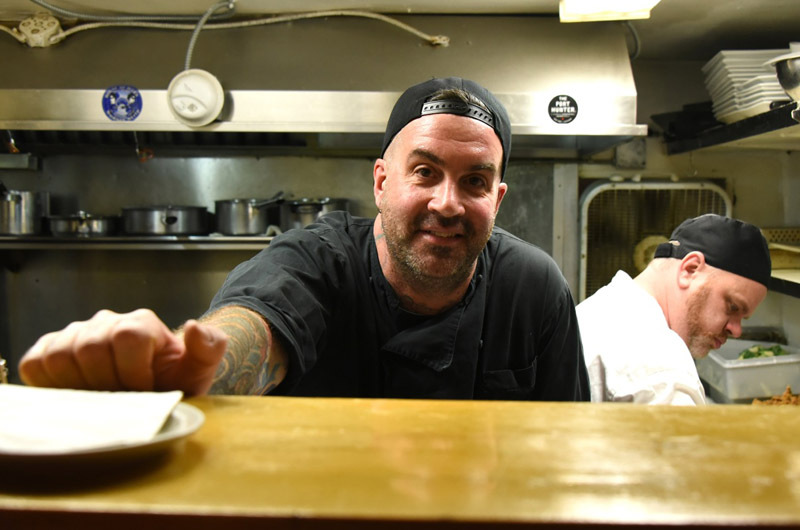 He changes the menu to keep things interesting, and to accommodate whatever he’s getting fresh from local fishermen and farmers. There are a couple of big memories about to be made here tonight. Ben and Erica come together in the kitchen to bring the Obamas the fortune cookie cupcakes Erica has made on short notice. Inside the cookies is a special message of thanks. They go out back, and soon Ben is rushing back in for his phone. The former president has suggested a picture. As they are ready to leave, the Obamas want to thank the staff. The Secret Service allows it — at least those who can stop for a second on this busy night. Not everyone will get a chance at a handshake. An interloper, I step back. As Mr. Obama reaches the two women in front of me, Alex rushes from the dining room back to his station. He pauses for a nanosecond, almost in midair. I see how badly he wants to stop and at that moment Mr. Obama looks up and over at him, extends his hand, and thanks him personally. The look on Alex’s face is a gift. Ben sees it too, and later gives Alex a nudge. I get a chance to shake Michelle Obama’s hand. The Obamas stop to say goodbye to Ben and his family before they walk out the door. The former President admires Clementine’s dimple and her sparkly shoes, and Michelle chats warmly with Erica and Sarah Omer, Clementine’s mother and a business partner in the Red Cat. As Ben lowers Clementine to the ground, Mr. Obama reaches out and gives Ben a bro hug and more words of thanks. It’s the moment I know Ben is grateful he could be truly present for. Thanks for sharing a slice of your life. Nice to see Ben's great tasting food being appreciated. This family, both families, make me cry. Thanks for this 1st person selection. I also grew up in the 1970's and witnessed my parents generation have oodles of fun. My father died of Lou Gehrig's disease at 59 but my mother is still alive and truckin', thankfully at 70. Great article. Thank you. I appreciate the honesty from the Chef that you interviewed. Everybody has a story. There should be no slow news days. Humanity is where it's at. Thanks again for a great read! Proud to know this good, smart, and very kind man.